576 pages | 58 B/W Illus. With this book, managers and decision makers are given the tools to make more informed decisions about big data purchasing initiatives. 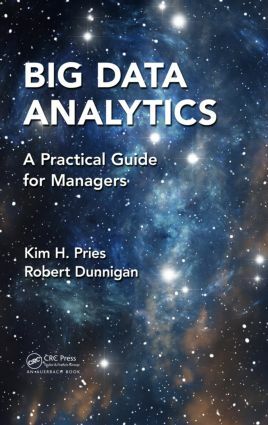 Big Data Analytics: A Practical Guide for Managers not only supplies descriptions of common tools, but also surveys the various products and vendors that supply the big data market. Comparing and contrasting the different types of analysis commonly conducted with big data, this accessible reference presents clear-cut explanations of the general workings of big data tools. Instead of spending time on HOW to install specific packages, it focuses on the reasons WHY readers would install a given package. The book provides authoritative guidance on a range of tools, including open source and proprietary systems. It details the strengths and weaknesses of incorporating big data analysis into decision-making and explains how to leverage the strengths while mitigating the weaknesses. The book further explores basic statistical concepts that, when misapplied, can be the source of errors. Time and again, big data is treated as an oracle that discovers results nobody would have imagined. While big data can serve this valuable function, all too often these results are incorrect, yet are still reported unquestioningly. The probability of having erroneous results increases as a larger number of variables are compared unless preventative measures are taken. The approach taken by the authors is to explain these concepts so managers can ask better questions of their analysts and vendors as to the appropriateness of the methods used to arrive at a conclusion. Because the world of science and medicine has been grappling with similar issues in the publication of studies, the authors draw on their efforts and apply them to big data. So What Is Big Data? The Central Question: So What? What Is Different bbout HBase? What Are the Various Modalities for Big Data Databases? How Does a Graph Database Work? What is the Performance of a Graph Database? p Value in Hypothesis Testing: A Successful Gatekeeper? What Is My Toolkit for Improving My Data? Kim H. Pries has four college degrees: a bachelor of arts in history from the University of Texas at El Paso (UTEP), a bachelor of science in metallurgical engineering from UTEP, a master of science in engineering from UTEP, and a master of science in metallurgical engineering and materials science from Carnegie-Mellon University. Pries worked as a computer systems manager, a software engineer for an electrical utility, and a scientific programmer under a defense contract for Stoneridge, Incorporated (SRI). He has worked as software manager, engineering services manager, reliability section manager, and product integrity and reliability director. In addition to his other responsibilities, Pries has provided Six Sigma training for both UTEP and SRI and cost reduction initiatives for SRI. Pries is also a founding faculty member of Practical Project Management. Additionally, in concert with Jon Quigley, Pries was a cofounder and principal with Value Transformation, LLC, a training, testing, cost improvement, and product development consultancy. He trained for Introduction to Engineering Design and Computer Science and Software Engineering with Project Lead the Way. He currently teaches biotechnology, computer science and software engineering, and introduction to engineering design at the beautiful Parkland High School in the Ysleta Independent School District of El Paso, Texas. Robert Dunniganis a manager with Janus Consulting Partners and is based in Dallas, Texas. He holds a bachelor of science in psychology and in sociology with an anthropology emphasis from North Dakota State University. He also holds a master of business administration from INSEAD, "the business school for the world," where he attended the Singapore campus. As a Peace Corps volunteer, Robert served over 3 years in Honduras developing agribusiness opportunities. As a consultant, he later worked on the Afghanistan Small and Medium Enterprise Development project in Afghanistan, where he traveled the country with his Afghan colleagues and friends seeking opportunities to develop a manufacturing sector in the country. Robert is an American Society for Quality–certified Six Sigma Black Belt and a Scrum Alliance–certified Scrum Master.